The latest issue of Perceptive Travel online magazine is out and just because of pure coincidence, three of the stories ponder what happens on the road when we think deep thoughts. Or just wonder what the heck we’re still doing in that place. In the fourth I decide no epiphany is necessary. Some places are just fun and can make you feel like a giddy kid again. We welcome a new writer to our pages again, Jonathan Arlan. After some aimless wandering in Serbia that’s not very satisfactory, living like a monk in the countryside seems to be a good way to shake things up and let the mind rest. See A Place Not to Think in Central Serbia. Kirsten Koza is back with a tale from Vietnam that probably won’t make it onto their tourism board website. It’s about squaring the horrors of the past with freak show profiteering in the present. See The Guilt Cafe in Vietnam. Marco Ferrarese gets a tip from a stranger at a bar about place hidden in the Himalayas that he has to see. The main attraction is a mummified monk on display for the faithful. See The Eyeless Blessing of Sangha Tenzin. Then I’ve got a watery story about the area around Lac Saint Jean and the Saguenay Fjord in rural Quebec. It’s a happy run of human-powered watersports and biking through miles of wild blueberries. See Sanguine on the Water in Saguenay. Plus we feature reviews of three new travel books: one serious, one silly, and one useful. How are your travel undies looking? We give away something useful each month on Perceptive Travel and somebody comes out happy after enjoying the good odds. This month reader Sunny from Washington is feeling especially sunny after scoring the nice Granite Gear rolling carry-on we featured in February. This month it’s something else useful. Travel underwear has to be pretty tough if you spend months out on the road. It’s the clothing you wear every day, after all, and need to wash the most. Thankfully we’re giving away four undie items to this month’s reader who gets pulled out of the randomizer after entering, thanks to Colombia Sportswear. If a male wins he gets a top and bottom for himself and the same for a friend or significant other. If a female wins, she gets a bottom and a sports bra or camisole for herself, t-shirt and undies for a male. You can only win if you’re connected. You missed this month’s newsletter if you’re not on the list, but get on it for next time. You can also follow along on Facebook and watch for the announcement. Thanks for checking out the best travel stories on the web from the publication that’s been bringing the goods for 10+ years. Interesting stuff here. Is the underwear comfortable enough to get through a long hot hike? So far so good in my tests! Quality synthetics are always better for this than cotton. Totally agree with you, when traveling, a good comfortable underwear collection is a must. Most of the people looking for good travel pants and stuff but doesn’t care about the important undies. 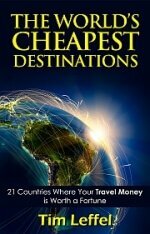 A great eye opener for everyone who loves travel.